Washington was accomplishing things that had never been done before. He was essentially covering new territory and because of this, almost all he did would become the standard. This is quite a statement and leaves artists a lot to live up to. They must try and portray him as not only accurate in form, but also portray a sense of accomplishment. Not necessarily as a god but as a great leader or even heroic to some extent. Aside from portraying the status of the man, his disfigured mouth; due to ill fitting dentures, posed the physical difficulty in accurately depicting him. The example photos are quite different and what is funny about the lower one is that even if the bust closely resembles him the rest of the body does not. The era and way in which he is portrayed is very laughable. The artist is attempting to show him in all his glory but has glorified him as a Greek or Roman god. This is not true to the times or country and has also idealized Washingtons body. Washington is a new kind of leader and should be demonstrated as such rather than immortalizing him in stone as the Greeks had done with their gods. I agree with the author of our textbook on this. Craven says early American painters like Feke and Peale had a problem depicting American heroes, because it was a new concept to the colonists. The tried-and-true European style of state portraiture was something they had no experience with. Also, the American tendency to avoid idealization and ostentation left them with awkward casual images of these heroic figures. I think that it’s funny that the American painters at the time had a hard time capturing the true character of George washington because they had the tendency to avoid idealization and ostentation representations when making their portrait of him. Because I feel that in today’s society that is exactly what we do when dealing with advertisements, and showing important figures. I feel George was so hard to capture has a simple idea. He was the one that all need to capture as a total copy. There could be no error or atheistic by the artist. Since he was the first leader of the new land people knew what was works were made of him were going to be everlasting and had to be perfect. His words seem to be humble of himself, maybe this lead others into make him in true form since he seems to be very important to others. I have to agree with the previous post thus far, George Washington was a powerful leader and it is hard to capture the leadership and heroism of someone so important. Not only does the artist need to aesthetically capture the looks and structure of the figure but make it emotionally powerful to live to its full potential. 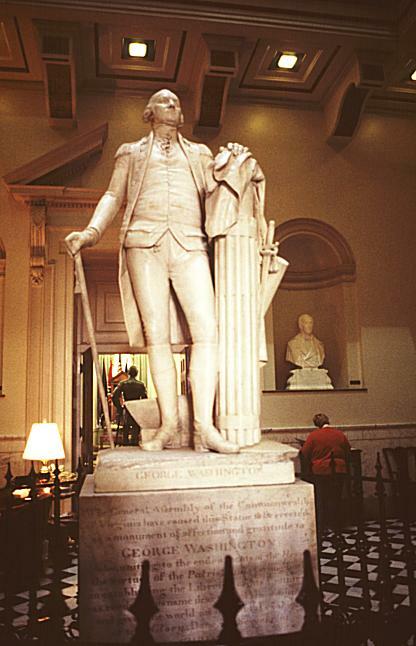 I do agree that these statues look more Greek related then anything and maybe artist(s) at this time were having a difficult time categorizing George Washington into something new since this was a first in this age. George Washington was and remains and American icon. His image is immediately recognizable. As a loved hero, many wanted to see his image depicted as such. I think this probably put a lot of pressure on the artists. It is possible the artist, when painting Washington, handled it differently than maybe he would most other portraits. It is possible many artists did not use their own interpretation of Washington, but also the outside influence of the public. I agree with the previous posts. I also think that during that time period it was hard to capture the likeness and essence of Washington because he was such an important figure in American history and because artists did not have such a great experience with portraying heroic figures, one would have trouble executing such a painting. Also, as learned in class, because of Washington’s teeth problems which altered the structure of his jaw contributed to the difficulty of the portraits. Maybe the reason the artists had such a hard time depicting George Washington was because he was such an important figure and they probably tried really hard to capture all of the qualities of Washington without success, it could have been too much pressure on them. Plus it doesnt help that many artists were self taught. The fact that he had false teeth also didnt help these artists. Capturing the likeliness of George Washington was to capture his accomplishments and not every artist has that ability. His statement basically asserts himself to be the model and guiding figure for the new government. I think most artist wrestled with this idea on their head as well and tried to capture not only his visual essence but this very character and trait. He was the first president, and i think there is a definite concern for him to be portrayed in all his facets and accomplishments. I think the most challenging thing that artists had in capturing George Washington’s likeness, is his personality. He had such a commanding presence that it was hard to create something that did him justice. Everything else would just fall flat. George Washington’s words do give a little insight. He led the army during the American Revolution and he was this country’s first official president. He was in completely uncharted territory, but he did the jobs with honor and integrity. I think artists back then tried to capture all that. Starting with Washington’s comment, it sounds a little discouraging for artists. The way I understand it is that he is basically saying that pictures of any form won’t be able to capture his true essence. For the same reasons mentioned in previous replies, I guess George Washington was so looked up to that many artists felt that they could not describe him artistically. I believe he presented a new form of challenge to colonial artists that only a few were able to tackle. Well firstly, I believe Washington was difficult for most artists to portray because of his teeth problems. Secondly, I believe he was difficult to paint because he was the first president. To paint such a hero and leader is a lot of pressure. People will no doubt be looking at these images for a long time. They had to not only capture his looks and presence, but his personality and spirit as well. Artists had a lot to live up to and perhaps they were too concerned thinking what the public would want instead of concentrating on rendering Washington in a heroic way. I believe Washington proved difficult for artists because he was going to be the first of many portraits and sculptures to be show as a national leader. Not many artists at the time knew how create such heroic artworks as well as european artists did, so to get Washington’s image right you truly had to knew every quality of him that made him great as to make his character stand out to future generations. The quote by Washington no doubt creating alot of pressure among artists but it the end I believed help artists to capture every quality of him,as to show someone who helped create a great nation. It was so difficult for artists to paint George Washington in a heroic style because it was so new to the artists, they had never had such a big responsibility. They had never had to paint someone as important as the 1st President of the United States before. Another reason that it was so difficult to portray George Washington as a heroic figure was because of the deformity in his face caused by dentures that were to large for his mouth. Only Gilbert Stuart could paint a portrait of Washington as our icon without showing his deformity. Painting George Washington posed a layer of problems for the artist. Earlier we established that portraiture is not solely a mere copy of the subject, but that its also a window into the personality of a person. Add the element of American aesthetic, of dignified grandeur that comes with being the first American president into the equation and you have a very difficult and complex task to accomplish. Its no surprise that many failed for the painting called for a variety of subtleties that were not necessarily present in American art at that time and their closest models consisted of ostentatious European portraits which were the antithesis of American ideals. The quote by George Washington explains exactly why it was problematic for artist to capture the true essence of the man. 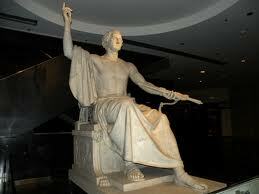 Washington and the other prominent figures in the beginning of America was to public an unknown type of leader. How were they to capture the idealist, innovative, and valiant persona which was unlike the old European style? The definition of Washington the revolutionary leader was hard even for him to describe. I think it was such hard time for artist to capture George Washington because in order to capture a successful likeness of an individual, an artist has to successfully capture the true likeness of both his physicality as well as his character. Because Washington was one of the first to be considered an iconic heroic figure by many colonist, I believe that it was hard to capture because such a prestigious, mighty power has never been seen before and to capture such emotion is quite a difficult task. This new power and leadership was quite new to America and the colonist and as Washington stated, “scarcely any part of my conduct which may not hereafter be drawn into precedent.” If he was the first to obtain such a significant presence, any would find it as a challenge to be the first to capture his true essence. To capture any individual is already a difficult task. To capture a hero, someone of Washington’s magnitude puts even more pressure on the artist. The piece must capture the likeliness to Washington and the new beliefs held him. They had to be able to capture the idea of a hero without glorifying it. These new ideas were a challenge. How are you able to set him apart from the rest without really setting him apart from the rest? Also Washington was a busy man, he didn’t have the time to pose for all the artists. I think artists must have felt challenged in capturing all that George Washington was in a portrait of likeness. To be able to mimic and express his charisma, accomplishments, and leadership qualities in art form had to be no easy task. It seems as if it would be a travesty if an artist were to fall short in paying homage to the American hero. This summer I had the privilege to visit Mount Vernon where George Washington lived. At one point during the visit the tour guide talked about his denchers. I think that Washington’s disapproval of his physical appearance made him not want to be the subject of someone’s painting. So his attitude may have been part of it. I think that it also has to do with the fact that this man was our first president. He was such an amazing leader and had accomplished so many things that it would be intimidating to try to create a likeness of him. Gilbert Stewart, on the other hand, was a man that was able to capture this man’s personality instead of just his physical appearance. He paid attention to every single detail of this man and created one of the most well known paintings of our first president. I think Washington may have been difficult to portray for artists because of the struggle between portraying him realistically and portraying him in some kind of idealized manner. He was the face and leader of a new country and many artists may have felt the need to reflect this in his image. As there was much pressure on Washington to set an excellent precedent for his successors, there was a lot of pressure on artists’ inner struggles of accurate and ideal depictions to portray Washington. This side of Washington is not always talked about. The egocentric side of George Washington is one of the main reasons why he was elected as the first president. I can identify with this side of Washington. In my opinion, to become legendary one must always be aware of the smaller aspects of character one is leaving behind. No aspect is too great nor too small, people will remember a legend in small acts and large alike. So spare no detail, overlook no flaw. His nose is said to be the hardest part to capture with in a portrait. Washington’s logic to be unrelenting in the perfection of his portrait is logically sound. In my opinion, he knew that at the end of the day people respond to visuals. I also think he knew he’d be remembered partly by what he did for this country, and partly remembered by the way he looked. Perfection is all in the details. Follow the way of George Washington, and bask in your own egocentrics.